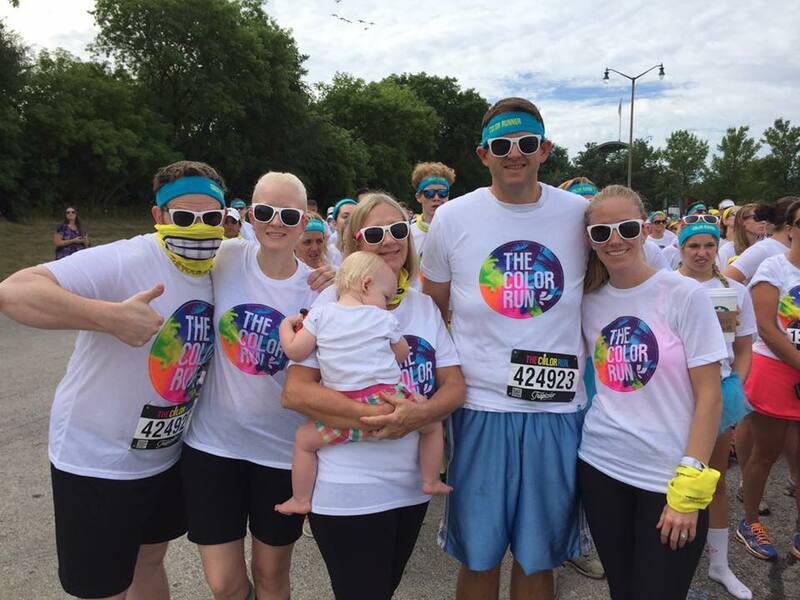 Surviving The Color Run with a baby/toddler/stroller | Kristen Dembroski, Ph.D. Yesterday morning, we completed The Color Run as a family. It’s something we’ve always wanted to do, and this meant bringing along our 1-year-old baby/toddler (I’m not sure what to call her!). I thought I might share our experience, in case it might help others. I have completed (and LOVED!) The Color Run before, so I knew what to expect going in. It was a new experience with a baby, however, but I felt prepared. Even though The Color Run peeps say the coloring is safe, I still didn’t want to expose my daughter to it. What can I say, I’m a paranoid First Time Mom. I was worried about it getting into her lungs and her eyes, so I knew I wanted to protect her as best I could. I asked around, and some people suggested goggles, face masks, hats, the whole 9 yards. I couldn’t imagine my daughter tolerating all that, nor did I want to deal with it, so I went the simpler (read: cheaper and lazier) route. I invested in a stroller rain cover similar to this one. I know what you’re thinking. Isn’t this taking all the fun out of it? Why bother doing a Color Run if you’re just going to skate through and come out lily-white on the other side? Well, I did actually have a lot of fun. I enjoyed seeing my family members get messy and silly, and my daughter enjoyed looking at all the fun colors, bubbles, and clouds of color dust. The excitement is palpable, so much fun music, smiling faces, and lots of high fives! It’s a great atmosphere, and truly is the happiest 5k on the planet. I know many other moms give their babies the true Color Run experience and have no problems, but I know that’s just not my personality, and I’m okay with that. You do you, and feel free to use the info in this blog post to make the best decisions for you and your family. You should be aware that a very real hazard, much more dangerous than the color dye itself, was the loud volume of the event. In the start up line, there were booming speakers that made my daughter scream. And at the end, the after party was a loud, bumping base full of Zumba fun. I love loud music, and it was really fun, but it is also very dangerous for such young ears. I would say to do your best to avoid areas with large speakers. A few other tips I have. I brought extra towels (to cover our car seats), changes of clothes and shoes, and garbage bags to put all the dirty stuff in afterwards. Bring your cell phone or camera, for sure! If you are really concerned, you can put it in a clear baggie to protect it from dust. But you won’t wanna miss these pictures! At the finish line, there are people with leaf blowers at a “blow station.” If you got dust on your stroller (and yourself for that matter), this is a great opportunity to remedy that. Also, we’ve found that blowing off the color is MUCH more effective than rinsing it with water, which just serves to spread it around. Bring water. Make sure you have a cold sippy for your baby. I also brought a frozen lunch bag with cold milk and fruits. If you have color treated hair, or really blonde hair like me and my daughter, the coloring might temporarily dye your hair. Hats are a great multipurpose solution. Laundry wasn’t a big deal for our clothes, but light colored shoes and anything made of terry cloth did pose a problem. Blow off, pre-treat, bleach, and sun dry. Drop a pin in Google Maps when you park your car so you can easily find it again! Dance, sing, have fun, and make memories! The powder is made of fine dusts and there is no guarantee that you will not be able to inhale them. Wrapping a bandana around your face will help protect your nose and mouth.